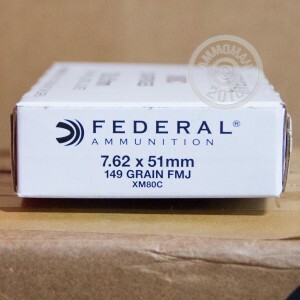 This 7.62 NATO ammunition from Federal is manufactured at the Lake City Army Ammunition Plant on the same assembly lines that supply the US military. As recent production surplus, it follows the M80 ball standard and fires a medium weight 149 grain full metal jacket bullet. 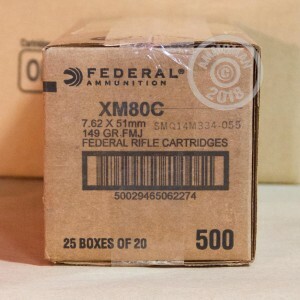 A highly sought after range load for M-14s, FALs, and other .308 Winchester/7.62 NATO rifles! 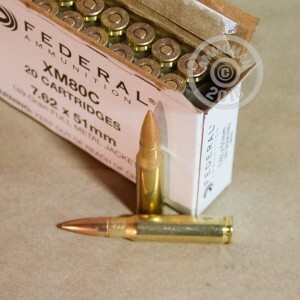 A powerful rifle cartridge introduced in the 1950s to take the place of the .30-06 Springfield, the 7.62 NATO cartridge is best known for its use in the M-14, which briefly served as the standard US infantry rifle before finding its niche among snipers and designated marksmen. The 7.62 NATO continues to be used by snipers and machine gunners in the US military today, as well as by foreign militaries still issuing battle rifles such as the FAL. Like other Lake City ammo, these cartridges use non-corrosive Boxer primers and reloadable brass cases with visible annealing marks.